e design was contacted to create an app for SPARKCon – the annual 4-day showcase for creativity, talent and ideas of “The Creative Hub of the South,” in downtown Raleigh, North Carolina. 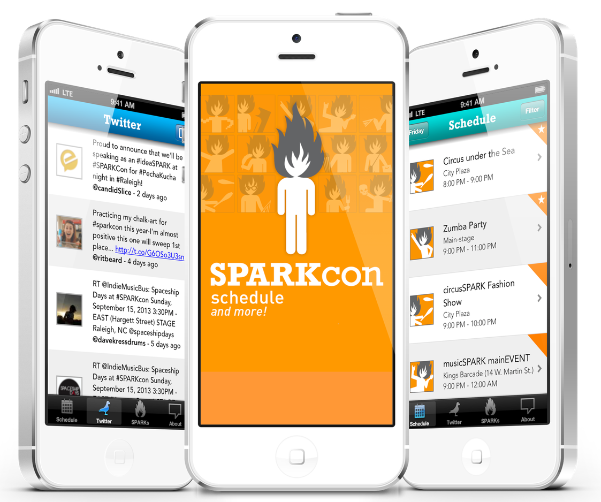 People at SPARKCon can search for #sparkcon tweets and also post tweets & photos directly from the app! Since the weather can be unpredictable, Push Notifications were incorporated into the app to notify people of last-minute venue changes. This app was designed by Gamil and programmed by e design.